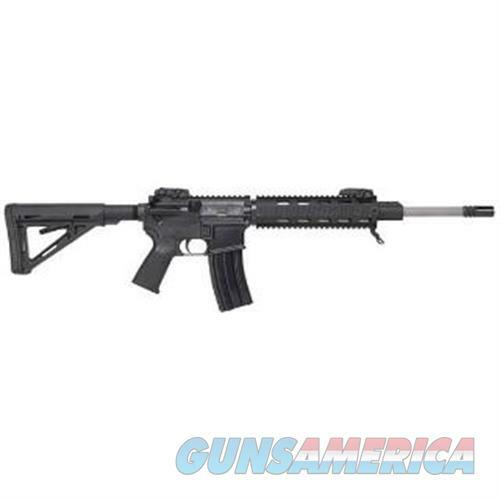 Description: DPMS - PANTHER ARMS™MID-LENGTH RECON RIFLE•Semi-auto gas-operated rotating bolt •8620 steel bolt carrier & phosphated steel bolt are heat treated & plated per Mil Spec •Forged upper & lower receiver is constructed from 7075-T6 aircraft aluminum alloy that is hard coat anodized per Mil Spec & Teflon® coated black •A3 flattop forged upper receiver includes Magpul BUIS rear sight dust cover shell deflector round forward assist & right hand ejection •Forged lower receiver includes semi-auto trigger group Magpul MOE trigger guard & pistol grip & aluminum magazine release button •416 SS button rifled heavy barrel features 6 grooves 1:9" twist & AAC Blackout flash •Magpul MOE stock •Handguard: Mid-length 4-rail DPMS free float tube •Front & rear Magpul BUIS sights •Wt. : 7.7 lbs. (empty) •OAL: 35.5" (extended) 31.75" (collapsed) •Includes (1) 30-round magazines & nylon web sling Cal. : 5.56x45mmBrl. : 16" Hvy. NOTE: AS OF FEBRUARY 1 2011 FACTORY NO LONGER SHIPS CLEANING KITS WITH RIFLES. NOTE: AS OF JANUARY 21 2013 FACTORY WILL ONLY SHIP ONE MAGAZINE WITH RIFLE.